The other day I went with a friend to dive on a local shallow wreck. I have seen millions of pictures of other people freediving, spearfishing and generally being under the water but this is only the second time I have seen pictures of me (the first time were Go Pro selfies with the wrong camera housing so they are a bit out of focus). For the first time this has allowed me to compare what I look like above water, with what I look like below. We all know that the light underwater is different, depending on depth some colours are filtered out and therefore some are emphasized, this is why things tend to look blue and green, while reds tend to disappear. But what I didn’t realise till I saw the picture below is the thing that stand out so boldly, which must ring alarm bells with any nearby fish, is the white writing; this is assuming they see the same colours as us, which they probably don’t! 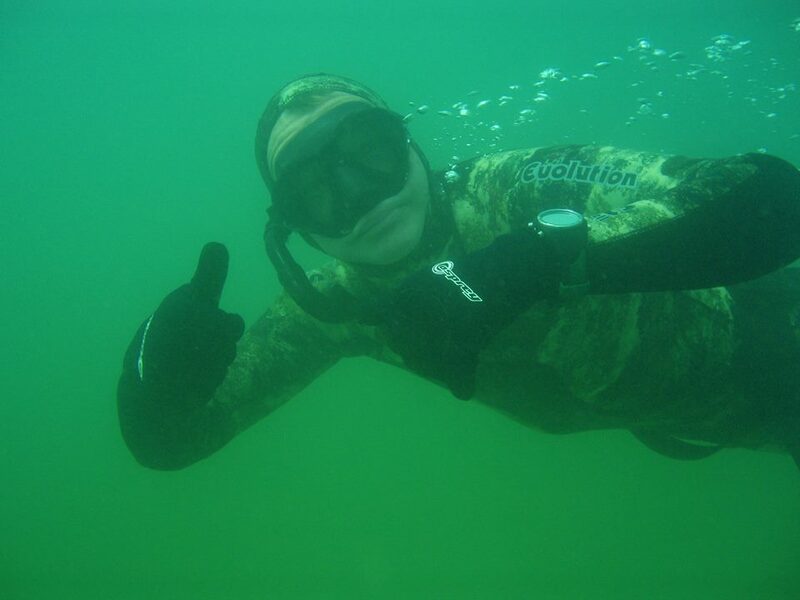 Me freediving – ignore the bubbles, poor form, I think I was trying to talk through my nose.. The logo on the back of my gloves is almost fluorescent, and also the wetsuit logo, why would someone produce a camo wetsuit then put a bright logo on the arm and chest? Even when I’m not spearfishing I still want to watch marine life close up without disturbing it, so I’m going to have to paint out those logos on the gloves, but the watch is also very reflective, maybe a neoprene flap to cover that over? When I was researching kit I thought that the attention really good spearos pay to camouflage was a little over the top, but now I am beginning to see what the problem is. The viz the other day was pretty poor and my buddy was almost invisible at anything more than 3m, but the thing that stood out was the yellow flash on her hood (she is a scuba diver, and they have so much shimmering metal and rubbish about their person that they don’t seem to worry as much about being visible). I’d be grateful for any info on how fish perceive us, what they see and what they don’t, if anyone has any knowledge in this area…. Could I paint myself with lots of small silver bait-fish to attract hungry bass?? This entry was posted in freediving, Marine Foraging, Spearfishing, Underwater Photography, Wetsuits & Gear and tagged camouflage, freedviing, light underwater on August 3, 2015 by mybluejourneyeditor.